Affordable Dentures & Implants - Akron, William Fischer, DDS, Inc.
Akron, Ohio Affordable Dentures & Implants offers several styles of full dentures, each with special features and advantages. It’s part of our mission to put transformation within reach. See below for more details, or call us at 330-235-1352 if you have a question about a particular style. Getting new dentures or implants is a big step. But the right solution, at the right price, can change your life in a very positive way. 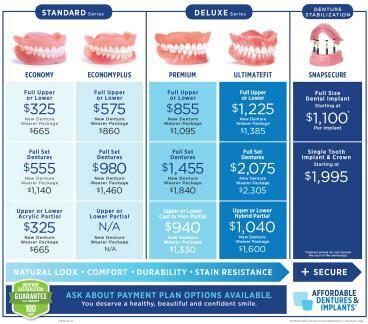 If you take a minute to compare Affordable Dentures & Implants with the rest, you'll see why we're part of an affiliated network providing America's largest number of dentures and implants. Now serving Akron, Cuyahoga Falls, Tallmadge, Barberton, Green, Brimfield, Medina, Hudson, Wadsworth, Richfield, Hartville and surrounding communities. Dr. Fischer earned his Doctor of Dental Surgery degree from The Ohio State University College of Dentistry. Please fill out the form below to request an appointment. For immediate assistance, please call us at 330-235-1352.